A curragh is a traditional Irish boat made of animal skins that fishermen on the Isle have used for centuries. 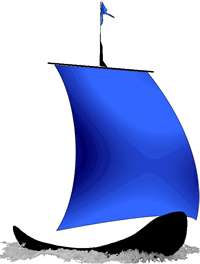 The story goes that around AD 800, St. Brendan and his buddies took a long sail in one of these, traveling as far as Iceland, Greenland, and perhaps North America. In the mid-1970s, a guy named Tim Severin repeated St. Brendan's journey by building a traditional curragh and sailing from Ireland to New York. Severin's The Brendan Voyage, published shortly before I was born, captured my father's imagination. The name Curragh-Labs also operates as a metaphor for the practice of New Media scholarship. If one agrees that we're entering electracy, the new age of human communication after orality and literacy, then it follows that the territory we're entering is uncharted. New Media scholars who study the history of communication media, Grammatologists, are like St. Brendan then: we're cobbling together what we already know about human communication from oral and literate cultures and using that knowledge to explore this new place. Since Curragh-Labs is the place I keep my teaching and online research materials, the designation labs seems appropriate. This website serves as the hub for my own experimentation with New Media scholarship and pedagogy, as well as a safe harbor for my students venturing forth on their own curraghs.